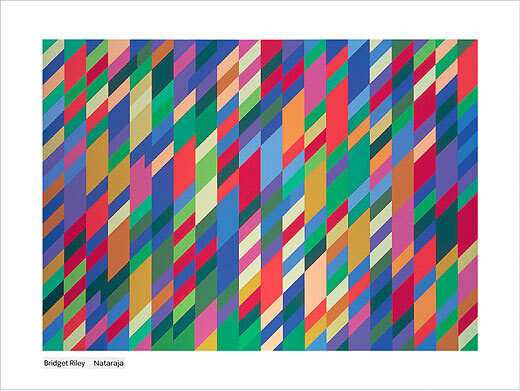 Birmingham Museum and Art Gallery currently have an exhibition of Bridget Riley’s work in the Waterhall. Being mostly unfamiliar with Riley’s work (except for the famous ‘Movement in Squares’, right), I thought I’d try to learn more. 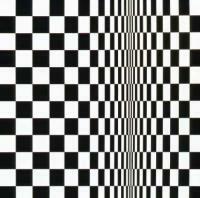 The exhibition covers Riley’s work from 1961, when she began to experiment with abstract work, and is full of both monochromatic and colourful op art images. In a geometric and tonal way, they are beautiful, though I can’t help but think that some of them are like having a migraine. I can’t look at them for long because of what they do to my eyes – which is in itself an interesting idea: art you can’t stare at. But they are so perfect, so immaculately painted and so exactly right in their use of colour, which is fascinating. The exhibition includes sketches and developmental works, and it’s really helpful to se e how the work has progressed to become a finished item. Yet it’s difficult, especially in the later works, not to be overwhelmed by the colour and size of the pictures; the exhibition notes say that Riley’s work is concerned with ‘movement, light and space’, and the colours and shapes do seem to move and come alive as one looks at them. There’s more information about Riley’s work here, which I found helpful, but I have this feeling I’m missing something important about it! Perhaps that’s because I couldn’t look for long enough.